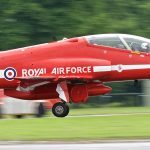 Back by popular demand, the RAF aerobatic display team the Red Arrows will be making an appearance on both days of the Festival of Flight 2018 Air Show on 18th and 19th of August. Representing the UK and showcasing the excellence of the Royal Air Force, the world renown team will be marking the RAF’s centenary year in a way only they know how. Here we look back at the Red Arrows’ incredible history and what it means to wear the red suit. It was in 1964 when the Royal Air Force amalgamated its various display teams into one premier unit – the Red Arrows. In the first season, the team flew seven aircraft at 65 shows and were based at RAF Fairford in Gloucestershire. The team increased to nine display aircraft in 1968 and the Diamond Nine became the Red Arrows’ trademark formation. Fast forward to today and some 4,660 displays later, the Red Arrows are one of the world’s top aerobatic display teams. Representing the speed, agility and precision of the RAF, the team is the public face of the Service. They assist in recruiting to the Armed Forces and act as ambassadors for the UK. Flying distinctive red Hawk jets, the team is made up of pilots, engineers and essential support staff with frontline, operational experience. The pilots are all volunteers. They must have completed one or more operational tours on a fast jet, have accumulated at least 1,500 flying hours and have been assessed as above average in their flying role to be eligible. Even then, competition for a coveted red flying suit is fierce. Pilots stay with the Red Arrows for a 3-year tour of duty. 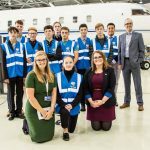 Three pilots are changed every year, so the team usually consists of three first year pilots, three second year pilots, and three in their final year. The Team Leader also spends three years with the team. The ‘Boss’, as he is known to the rest of the team, is always a pilot who has previously completed a 3-year tour with the Red Arrows. During the second half of each display the Red Arrows split into two sections. Reds 1 to 5 are known as ‘Enid’ (named after Enid Blyton, author of the Famous Five books) and Reds 6 to 9 are known as ‘Gypo’ (the nickname of one of the early pilots). Enid continue to perform close formation aerobatics while Gypo perform more dynamic manoeuvres. Red 6 (Syncro Leader) and Red 7 (Synchro 2) make up the Synchro Pair and they perform a series of opposition passes during this second half. The teamwork shown by the pilots in the air is reflected in the dedication and professionalism of the support staff on the ground. This team is made up of a team manager, a supervisor (Red 10), a public relations manager, two engineering officers, an adjutant and approximately 85 engineering technicians and other support staff. The latter are known as ‘The Blues’ because they wear distinctive royal blue flying suits during the display season. The Blues represent nine out of the Royal Air Force’s broad range of more than 65 technical and non-technical trades. Every team member has undergone intensive training in their particular specialization throughout their RAF career. Red 10, is a fully qualified Hawk pilot who flies the tenth aircraft when the Red Arrows are away from base. This means the team have a reserve aircraft at the display site. 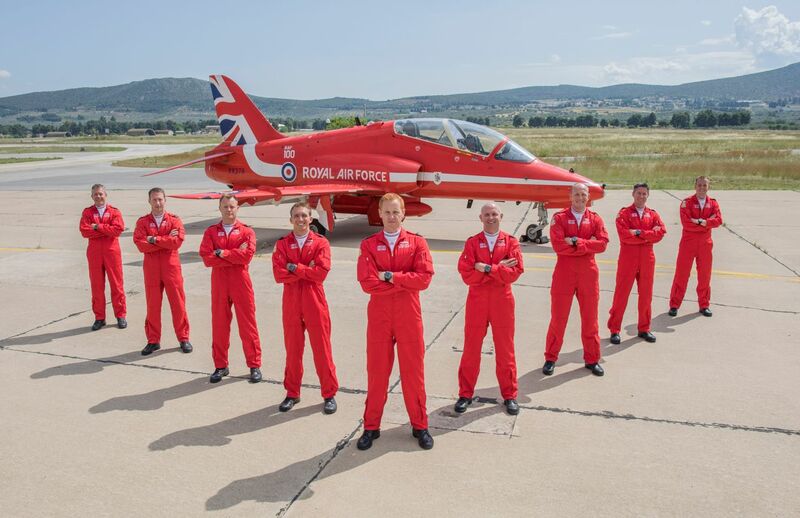 Red 10’s duties include co-ordination of all practices and displays and acting as the team’s Ground Safety Officer. Red 10 often flies TV cameramen and photographers for air-to-air pictures of the Red Arrows and also provides the commentary for all of the team’s displays. The Red Arrows have flown 2 different aircraft types. The first 1,292 displays were flown in the Folland Gnat but they were exchanged for the current type – the BAe Hawk – in the winter of 1979 for use the following season. 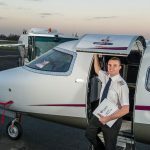 The current aircraft are essentially the same as those flown by Advanced Flying Training students at Royal Air Force Valley, with the exception of smoke generation modifications and a slightly uprated engine which gives a faster response time. 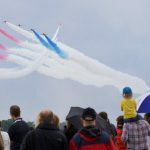 The smoke generation system pumps diesel mixed with appropriately coloured dye into the jet exhaust to produce the vapour trails that the Red Arrows are famous for. These trails are used mainly for flight safety reasons so the pilots can judge wind speed and direction whilst performing their displays. However, the effects of the trails also look good, enhancing the show for the audience on the ground. Each aircraft can carry enough diesel and dye to create five minutes of white smoke, one minute of red and one minute of blue during the display. The Red Arrows are part of the wider Royal Air Force and the team is a great reminder of the dedication and talented people found across the Service. Indeed, members of the Squadron have all served on operational units, whether they be fast jet or helicopters, strategic transport or intelligence-gathering aircraft. Their backgrounds hint at the wide range of tasks the Royal Air Force performs today and is prepared for. As an example, current pilots have completed operational tours in Afghanistan and Libya. Some have also been part of the Quick Reaction Alert in the UK and Falkland Islands, protecting our skies. They are the Best of British. They are the Red Arrows. Don’t miss out, buy your tickets for the Festival of Flight 2018 now.